It seems that I have identified triple usage of the 10mm 1990 Kalakaua I King of Hawaii obverse die used by The Royal Hawaiian Mint. 1. I’ve been trying to track down why the 1941-1991 Pearl Harbor Dala has a 1990 dated Kalakaua I King of Hawaii obverse. It makes no sense to have an obverse year that does not match the Pearl Harbor Attack 50th anniversary year (i.e. 1991) of the reverse. If the dies were made at the same time both the obverse and reverse would have been dated 1991. 2. The 1941-1991 Pearl Harbor Dala is 10mm in diameter. A search of the RHM records indicated that no 10mm 1990 dated Kalakaua I King of Hawaii coin was struck in 1990 or earlier. 3. RHM records indicate that the year 1989 is when the RHM began striking 10mm coins (B a Star Coin and Liliuokalani Gold IKI are the 10mm coins). 4. 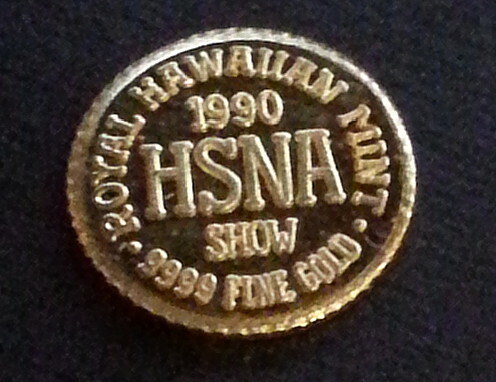 In 1989, the RHM records indicate it struck 13mm Hawaii State Numismatic Association (HSNA) gold coins. These were not sanctioned/endorsed by the HSNA governing body per M&R. Mintage was 100 specimens. Also identified as M&R 2M-200. 5. In 1990, the RHM records indicate it struck 13mm HSNA gold coins (Kalakaua HSNA and Liliuokalani HSNA) with mintages of 25 specimens for each. 6. An error was found (in the RHM records) that states that the 1990 13mm Kalakaua I King of Hawaii HSNA weighs 1 gram. It can be stated that an incorrect entry was made. The 13mm should in fact be 10mm due to the 1 gram weight (a 13mm gold coin weighs 1/20 oz). 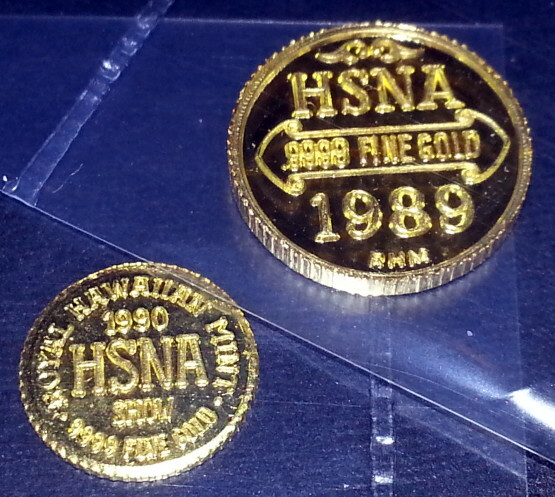 This is the 13 mm 1989 gold HSNA coin vs the 10mm 1990 gold HSNA. 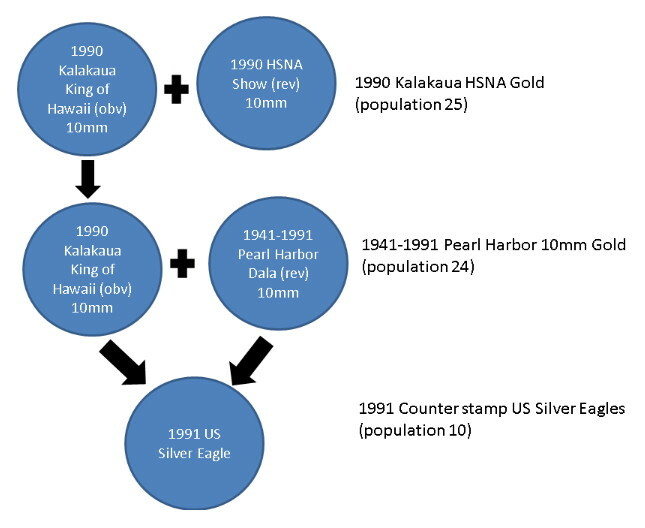 This is the 10mm comparison of the 1990 HSNA and 1991 Pearl Harbor and 13mm 1989 HSNA.